Ask and ye shall receive... at least sometimes. 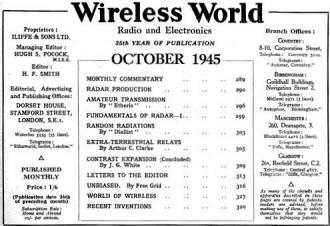 I posted a request for an article by science fiction writer Arthur C. Clarke, of 2001: A Space Odyssey fame, describing a geostationary satellite system that was published in the October 1945 edition of Wireless World magazine. Thanks to RF Cafe visitor Terry W., from the great state of Oklahoma, it is now available for everyone to enjoy. Clarke was not just a sci-fi writer, but also an educated visionary and card-carrying member of the British Interplanetary Society, who proposed many technological solutions to issues of his day. In this instance, the challenge was developing an efficient means to distribute TV signals across Europe and the world. Clarke's calculations for the necessary number of repeater towers proved that concept impractical, so he proposed using modified surplus German V2 rockets to launch Earth-orbiting "artificial satellites," powered by batteries or solar panels, to distribute signals globally. 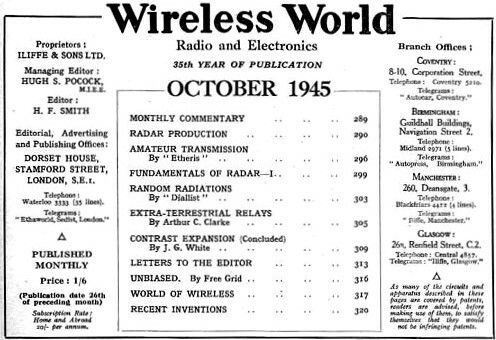 He calculated power densities, orbit altitudes and periods, S/N ratios, and antenna sizes. You will want to read this article; it only takes about 15-20 minutes. 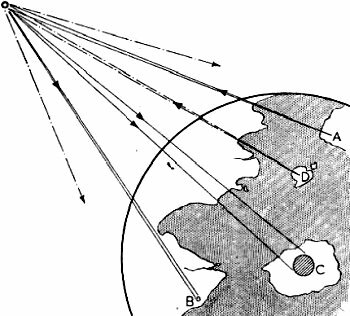 Although it is possible, by a suitable choice of frequencies and routes, to provide telephony circuits between any two points or regions of the earth for a large part of the time, long-distance communication is greatly hampered by the peculiarities or the ionosphere, and there are even occasions when it may be impossible. A true broadcast service, giving constant field strength at all times over the whole globe would be invaluable, not to say indispensable, in a world society. Unsatisfactory though the telephony and telegraph position is, that of television is far worse, since ionospheric transmission cannot be employed at all. The service area of a television station, even on a very good site, is only about a hundred miles across. 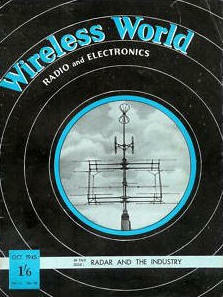 To cover a small country such as Great Britain would require a network of transmitters, connected by coaxial lines, waveguides or VHF relay links. A recent theoretical study1 has shown that such a system would require repeaters at intervals of fifty miles or less. A system of that kind could provide television coverage, at a very considerable cost, over the whole of a small country. It would be out of .the question to provide a large continent with such a service, and only the main centres of population could be included in the network. The problem is equally serious when an attempt is made to link television services in different parts of the globe. A relay chain several thousand miles long would cost millions, and transoceanic services would still be impossible. Similar considerations apply to the provision of wide-band frequency modulation and other services, such as high-speed facsimile which are by their nature restricted to the ultra-high-frequencies. Many may consider the solution proposed in this discussion too far-fetched to be taken seriously. Such an attitude is unreasonable, as everything envisaged here is a logical extension of developments in the last ten years - in particular the perfection of the long-range rocket of which V2 was the prototype. 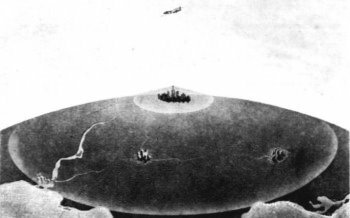 While this article was being written, it was announced that the Germans were considering a similar project, which they believed possible within fifty to a hundred years. Before proceeding further, it is necessary to discuss briefly certain fundamental laws of rocket propulsion and "astronautics." A rocket which achieved a. sufficiently great speed in flight outside the earth's atmosphere would never return. 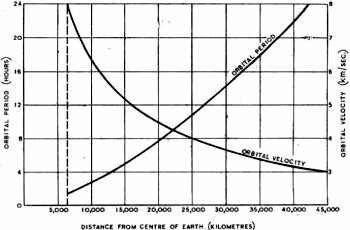 This "orbital" velocity is 8 km per sec, (5 miles per sec), and a rocket which attained it would become an artificial satellite, circling the world forever with no expenditure of power - a second moon, in fact. The German transatlantic rocket Aro to would. have reached more than half this velocity. Fig. 1 - Variation of orbital period and velocity with distance from the centre of the earth. There are an infinite number of possible stable orbits, circular and elliptical, in which a rocket would remain if the initial conditions were correct. The velocity of 8 km/sec. applies only to the closest possible orbit, one just outside the atmosphere, and the period of revolution would be about 90 minutes. As the radius of the orbit increases the velocity decreases, since gravity is diminishing and less centrifugal force is needed to balance it. Fig. 1 shows this graphically. The moon, of course, is a particular case and would lie on the curves of Fig. 1 if they were produced. The proposed German space-stations would have a period of about four and a half hours. It will be observed that one orbit, with a radius of 42,000 km, has a period of exactly 24 hours. A body in such an orbit, if its plane coincided with that of the earth's equator, would revolve with the earth and would thus be stationary above the same spot on the planet. It would remain fixed in the sky of a whole hemisphere and unlike all other heavenly bodies would neither rise nor set. A body in a smaller orbit would revolve more quickly than the earth and so would rise in the west, as indeed happens with the inner moon of Mars. Although such an undertaking may seem Fantastic, it requires for its fulfillment rockets only twice as fast as those already in the design stage. Since the gravitational stresses involved in the structure are negligible, only the very lightest materials would be necessary and the station could be as large as required. and area C; transmission from D being relayed to whole hemisphere. Let us now suppose that such a station were built in this orbit. It could be provided with receiving and transmitting equipment (the problem of power will be discussed later) and could act as a repeater to relay transmissions between any two points on the hemisphere beneath, using any frequency which will penetrate the ionosphere. If directive arrays were used, the power requirements would be very small, as direct line of sight transmission would be used, There is the further important point that arrays on the earth, once set up, could remain fixed indefinitely. It may be argued that we have as yet no direct evidence of radio waves passing between the surface of the earth and outer space; all we can say with certainty is that the shorter wavelengths are not reflected back to the earth. Direct evidence of field strength above the earth's atmosphere could be obtained by V2 rocket technique, and it is to be hoped that someone will do something about this soon as there must be quite a surplus stock somewhere! Alternatively, given sufficient transmitting power, we might obtain the necessary evidence by exploring for echoes from the moon. In the meantime we have visual evidence that frequencies at the optical end of the spectrum pass through with little absorption except at certain frequencies at which resonance effects occur. Medium high frequencies go through the E layer twice to be reflected from the F layer and echoes have been received from meteors in or above the F layer. It seems fairly certain that frequencies from, say, 50 Mc/s to 100,000 Mc/s could be used without undue absorption in the atmosphere or the ionosphere. 30 E - Africa. and Europe. 150 E - China and Oceana. 90 W - The Americas. The stations in the chain would be linked by radio or optical beams, and thus any conceivable beam or broadcast service could be provided. Fig. 3 - Three satellite stations would ensure complete coverage of the globe. The technical problems involved in the design of such stations are extremely interesting,3 but only a few can be gone into here, Batteries of parabolic reflectors would be provided, of apertures depending on the frequencies employed. Assuming the use of 3,000 Mc/s waves, mirrors about a metre across would beam almost all the power on to the earth. Larger reflectors could be used to illuminate single countries or regions for the more restricted services, with consequent economy of .power. On the higher frequencies it is not difficult to produce beams less than a degree in width, and, as mentioned before, there would be no physical limitations on the size of the mirrors. (From the space station, the disc of the earth would be a little over 17 degrees across). The same mirrors could be used for many different transmissions if precautions were taken to avoid cross modulation. e = 6.85 √P / d volts/metre, where P is the power radiated in watts. If we assume e to be 50 micro­volts/metre, which is the F.C.C. standard for frequency modulation, P will be 94 kw. This is the power required for a single dipole, and not an array which would concentrate all the power on the earth, Such an array would have a gain over a simple dipole of about 80. The power required for the broadcast service would thus be about 1.2 kW. 30,000 ft., and equipped with television and FM transmitters. Ridiculously small though it is, this figure is probably much too generous. Small parabolas about a foot in diameter would be used for receiving at the earth end and would give a very good signal/noise ratio. There would be very little interference, partly because of the frequency used and partly because the mirrors would be pointing towards the sky which could contain no other source of signal. A field strength of 10 microvolts/metre might well be ample, and this would require a transmitter output of only 50 watts. When it is remembered that these figures relate to the broadcast service, the efficiency of the system will be realised. The point­to-point beam transmissions might need powers of only 10 watts or so. These figures, of course, would need correction for ionospheric and atmospheric absorption, but that would be quite small over most of the band. The slight falling off in field strength due to this cause towards the edge of the service area could be readily corrected by a nonuniform radiator. A second fundamental problem is the provision of electrical energy to run the large number of transmitters required for the different services. In space beyond the atmosphere, a square metre normal to the solar radiation intercepts 1.35 kW of energy.6 Solar engines have already been devised for terrestrial use and are an economic proposition in tropical countries. They employ mirrors to concentrate sunlight on the boiler of a low-pressure steam engine. Although this arrangement is not very efficient it could be made much more so in space where the operating components are in a vacuum, the radiation is intense and continuous, and the low-temperature end of the cycle could be not far from absolute zero. Thermoelectric and photoelectric developments may make it possible to utilise the solar energy more directly. Fig. 4 - Solar radiation would be cut off for a short period each day at the equinoxes. Though there is no limit to the size of the mirrors that could be built, one fifty metres in radius would intercept over 10,000 kW and at least a quarter of this energy should be available for use. The station would be in continuous sunlight except for some weeks around the equinoxes, when it would enter the earth's shadow for a few minutes every day. Fig.-4 shows the state of affairs during the eclipse period. For this calculation, it is legitimate to consider the earth as fixed and the sun as moving round it. 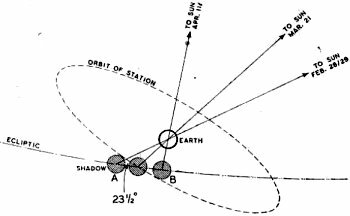 The station would graze the earth's shadow at A, on the last day in February. Every day, as it made its diurnal revolution, it would cut more deeply into the shadow, undergoing its period of maximum eclipse on March 21st, on that day it would only be in darkness for 1 hour 9 minutes From then onwards the period of eclipse would shorten, and after April 11th (B) the station would be in continuous sunlight again until the same thing happened six months later at the autumn equinox, between September 12th and October 14th The total period of darkness would be about two days per year, and as the longest period of eclipse would be little more than an hour there should be no difficulty in storing enough power for an uninterrupted service. (1) It is the only way in which true world coverage call be achieved for all possible types of service. (2) It permits unrestricted use of a band at least 100,000 Mc/s wide, and with the use of beams an almost unlimited number of channels would be available. (3) The power requirements are extremely smart since the efficiency of "illumination" will be almost 100 per cent. Moreover, the cost of the power would be very low. (4) However great the initial expense, it would only be a fraction of that required for the world networks replaced, and the running costs would be incomparably less. The development of rockets sufficiently powerful to reach "orbital" and even "escape" velocity is now only a matter of years. The following figures may be of interest in this connection. The advent of atomic power has at one bound brought space travel half a century nearer. It seems unlikely that we will have to wait much as twenty years before atomic-powered rockets are developed. and such rockets could reach even the remoter planets with a fantastically small fuel/mass ratio ---only a few per cent. The equations developed in the appendix still hold, but v will be increased by a factor of about. a thousand. In view of these facts, it appears hardly worth, while to expend much effort on the building of long-distance relay chains. Even the local networks which will soon be under construction may have a working life of only 20-30 years. 3 "Das Problem der Befahrung des Weltraums," Hermann Noordung. 4 "Frequency Modulation," A. Hund. (McGraw Hill). 5 "London Television Service," MacNamara amd Birkinshaw. J.I.E.E., Dec. 1938. 6 "The Sun," C. G. Abbot. (Appleton-Century Co.). 7 "Journal of the British Interplanetary Society," Jan., 1939.